Sugar: Changing fortunes or just short-term relief? Emerging market currencies are playing a key role in price movements across the commodities complex, and the Brazilian real (BRL) and sugar market are no exception. The BRL has been volatile of late as a result of broader emerging market concerns, whilst the upcoming Brazilian election has only added to this volatility. 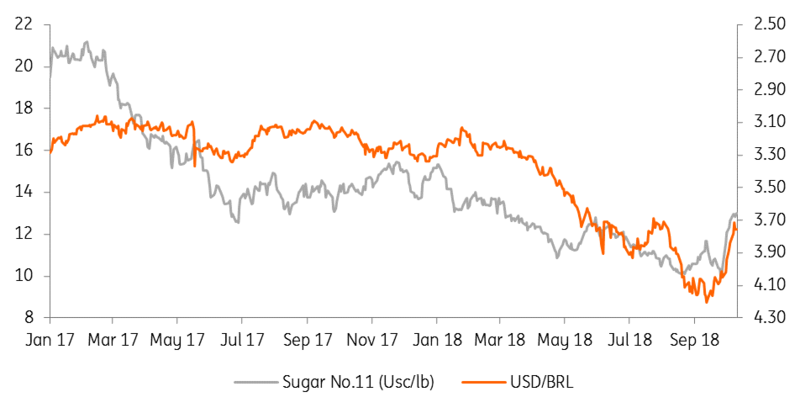 The previous move lower in the sugar market coincided with the BRL weakening to 4.20 to the USD, whilst the 30% rally since late September, coincided with an almost 12% appreciation in the BRL. Our LatAm economist is forecasting the BRL at 3.70 by year-end, but given the recent sharp rally in the currency already, it does suggest further strength will be rather limited. Therefore further strength in sugar prices due to currency moves should be fairly limited as well. The recent rally in the sugar market isn't just about currency moves, fundamentals have also played a role. The fundamental drivers we identify are continued downgrades to the CS Brazil crop, while it is also looking increasingly likely that EU export availability will be lower over the 2018/19 season. 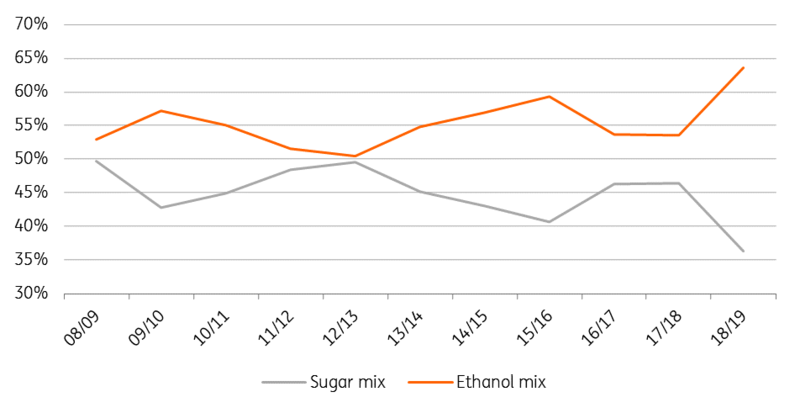 Starting with CS Brazil, it was always expected that sugar production would fall significantly year-on-year, with domestic ethanol prices offering a much more attractive return to mills, which have therefore maximised ethanol production over the season. The cumulative sugar mix so far this season stands at just 36.37%, compared to 48.25% at the same stage last year. In terms of what this actually means for sugar production, cumulative production stands at 22.27mt, down 24% YoY. Expectations for the season as a whole are that sugar production will total a little over 27mt, down from 36mt last season. Yields have also turned out to be worse than initially expected, and as a result cane availability has decreased versus initial expectations. Mills in the region are, in fact, expected to shut early, due to cane shortages. The total cane crush this season is expected to total around 550mt, down from 596mt last season. Looking ahead to next season, while it is still some distance away and a lot will depend on weather over the off crop, yields could be under pressure once again. The low price environment that we have seen for quite some time now means that we have likely seen minimal investment in fields, and so the industry will be dealing with the issue of aging cane. This will become more of a focus for the market as we approach the 2018/19 harvest in April. Then there is the EU, the summer already saw a volatile grains market as a result of dry and hot weather, and now we are starting to see the impact of this on the European sugar market. We have entered the second season following the lifting of production quotas, and strong production over 2017/18 weighed heavily on European prices, and a significant increase in exports only added further downward pressure for the world market. Looking at the 2018/19 season that has just got underway, area is less than 1% lower YoY according to the European Commission. However, yields are expected to fall by almost 9% YoY to 11.5t/ha, with dry and hot weather over the summer clearly having an impact on beets. As a result of lower yields, production in the 2018/19 season is forecast to total 19.2mt, down from 21.1mt last season. As a result of this, export availability for the 2018/19 season is expected to fall quite significantly. Exports over 2017/18 are estimated to have totalled 3.3mt, while for the current season the Commission is forecasting that exports fall to 2.6mt. However, we do see the potential for further downside to this number, as the current balance sees the stocks to use ratio in the EU fall below 10% at the end of the season, from about 14% at the start of the season. A tightening EU balance does suggest that the lows are behind us for EU prices, adding further support to this view is the expectation that for the 2019/20 season we will see more substantial reductions in EU sugar beet area. According to media reports, French producer Tereos has asked farmers to reduce area by 5% for 2019 plantings, a trend that we could see across the region. The bearish factor which is likely to outweigh these more constructive developments in the short- to medium-term is the continued threat of Indian sugar making its way onto the world market. India is set to see another record crop in the 2018/19 season, with the country estimated to produce 35mt of sugar, surpassing last season’s record 32mt. This would mean that India will see a domestic surplus this season of around 9mt, following the 7mt surplus last season, and so sugar mills and the government will be very keen to see surplus sugar exported to the world market. The country failed to export any sizeable volumes to the world market over 2017/18, given that the world market was trading at a large discount to Indian domestic prices. This still remains the case as we move further into the 2018/19 season, and so the government has decided to offer subsidies in the form of direct payments to farmers, and transportation subsidies from mill to ports for up to 5mt of sugar. The subsidy works out to around US$150/t, and so does help to make Indian sugar competitive on the world market. Recent strength in the world market and a depreciating Indian rupee help to make Indian sugar even more competitive. In sum, the global sugar market is set to remain in surplus over the 2018/19 season, largely as a result of India, and assuming this sugar makes its way onto the world market, we believe prices will remain under pressure for much of the season. It is further forward that the outlook appears to be more constructive. 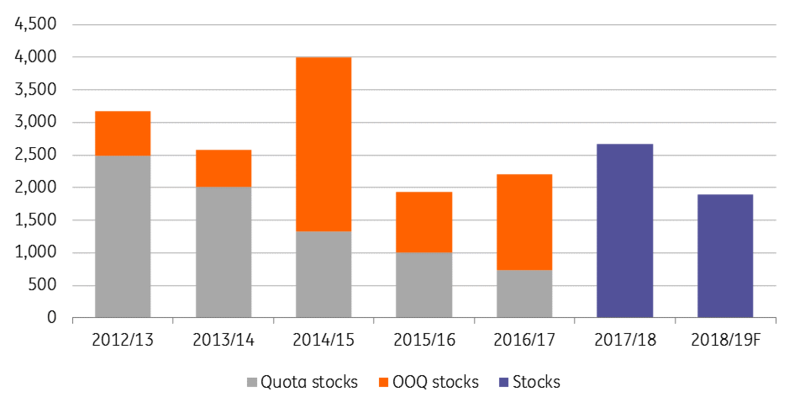 An expected reduction in 2019 EU plantings and aging CS Brazil cane mean that the 2019/20 balance will likely be tighter.